The United States will become a "majority-minority" country by the mid-2040s, facing planners with both opportunities and challenges. Demographic changes are increasing the ethnic, racial, and cultural diversity of cities and towns across the country — but historical patterns of segregation and racial discrimination have left many communities of color disadvantaged and underserved, while immigrants face uncertainty in today's political climate. Planning With Diverse Communities offers the information and tools planners need to engage people of color in planning processes and improve quality of life for all in ethnically and racially diverse communities. The authors explore the country's changing demographics, review the social and economic inequities facing many communities of color, and describe the resulting challenges confronting planners. Chapters focus on frameworks and approaches to better engage people of color, including immigrants, in planning processes, and on tools and strategies to improve economic opportunity, transportation access, housing options, health and safety, and placemaking in diverse communities. The responsibility of planners to serve diverse publics and build better, more inclusive communities is more important than ever before. 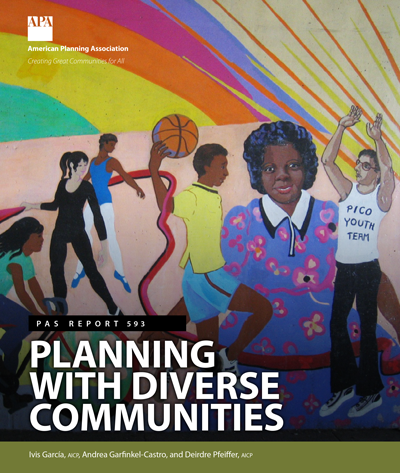 This PAS Report will help planners better address the social, cultural, and economic needs of diverse communities to reap the potential benefits of growing diversity and create more equitable communities for everyone. Ivis García, AICP, PhD, is an assistant professor in the City and Metropolitan Planning department at the University of Utah. She is a fellow and board member of the Asset Based Community Development Institute at DePaul University, Chicago. García earned her PhD in urban planning and policy from the University of Illinois at Chicago. She holds dual master's degrees from the University of New Mexico in community and regional planning and Latin American studies and a bachelor's degree in environmental sciences from Inter-American University in Puerto Rico. Andrea Garfinkel-Castro is a doctoral candidate in the Metropolitan Planning, Policy, and Design program at the University of Utah. She is developing a long-term transportation research project engaging planning faculty and students around the world to explore ways to implement low-cost safety measures to protect the world's most vulnerable pedestrians — those who are poor. Garfinkel-Castro is also conducting theoretical research that explores planning culture and the ways planners are adapting to the changing needs of communities in the face of evolving demographics. Deirdre Pfeiffer, AICP, PhD, is an associate professor in the School of Geographical Sciences and Urban Planning at Arizona State University. Pfeiffer currently is exploring the interconnections between housing and health, the housing experiences of millennials and seniors, and the effects of single-family rentals on neighborhoods. She also is deeply committed to community partnerships to help solve pressing housing issues in Arizona. Pfeiffer holds a master's degree and PhD in urban planning from the University of California–Los Angeles.